Just as we sign off every letter in a particular style, we may want to end every Post with a standard text, signature, logo, graphic or link. There are 2 ways to have this pre-formatted text automatically appear in the template or post template, so that you need not have to retype them every time you post. The first method is to modify the template. Readers who have followed our guides to insert Social Bookmarking Links, AdSense Codes, Digg buttons, etc., will be familiar with template modification. Still, we would recommend this only to the users who are proficient in CSS and codes. If you want the standard text to appear right after the Post Title but before the Blog Post, insert the TEXT above this code. If you'd like the text to appear immediately after the Blog Post but before the “Posted by” line in the Footer, insert the TEXT below this code. You can also have images, text links, etc. instead of plain text. These codes are discussed in Hyperlinks and Image Links. This method is what we think every Blogger can easily use to insert standard text, boilerplate clauses or pictures into every post. It is Blogger's way of saving you the time of retyping these into every post. You can therefore configure the text that you want, and insert that once into the Post Template. This text will always appear in the Post Editor when you create a new Post in the same manner as a signature is appended to each of your Yahoo or Google mail. In short, your Post Editor is now pre-formatted to include this text. First, create a draft post. Use the “Compose” mode and type in the text, add the links, change the font style and color, etc. When you are happy with the text, switch to “Edit HTML” mode. Copy the entire piece of writing together with all the style codes. Next, go to Settings -> Formatting and at the bottom of the page, you will see a “Post Template” box. Paste the code into the box and click “Save Settings”. The draft post we created may be deleted. 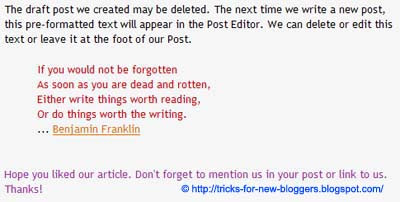 The next time we write a new post, this pre-formatted text will appear in the Post Editor. We can delete or edit this text or leave it at the foot of our Post. Thanks for your help! Even though I have tweaked my template quite a bit, I never realized how to do this... now you've saved me an extra step of adding my signature on every post! Thank you! I'm trying to do something similar to this, something like a blockquote, but after I have the div class, the rest of the post doesn't follow the default format of the post text. I want everything to look the same, but something is happening with the div class. "Look forward to hearing from you again." Thanks. How often do you post?